The use of expensive roofing materials is not always justified. Often for the construction of balcony canopies, flat and some types of pitched roofs used roofing material. 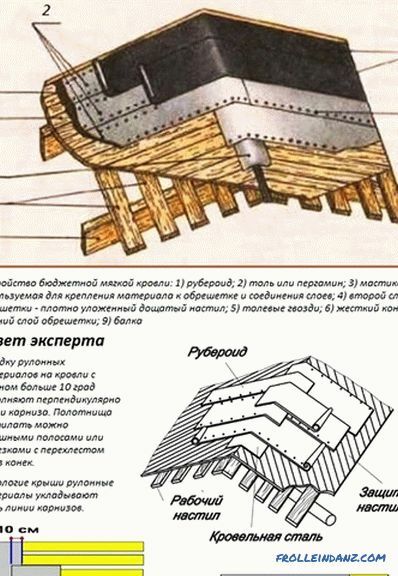 This material is known to many consumers since Soviet times. It is worth noting that the roofing material is not inferior in performance to soft tile, moreover, that the price for it is much lower. To ensure reliability, and as a result, and durability of the roof, we suggest you read this article. It will discuss how to cover the roof with ruberoid with your own hands. 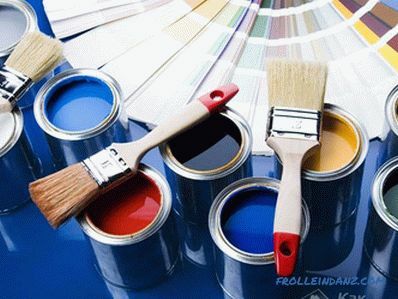 Roofing material is also known as roofing paper. 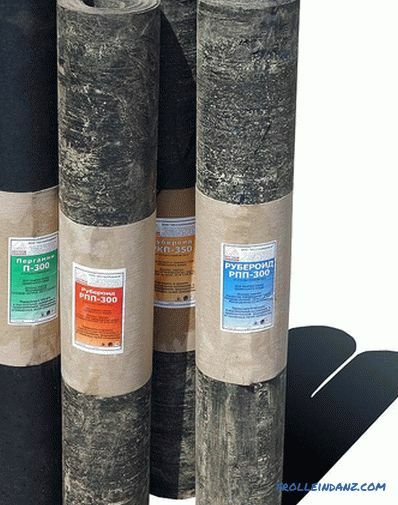 It is used for roofing and waterproofing the foundation. This material is quite soft and flexible. Resistance to UV radiation, temperature extremes and aggressive environmental exposure. 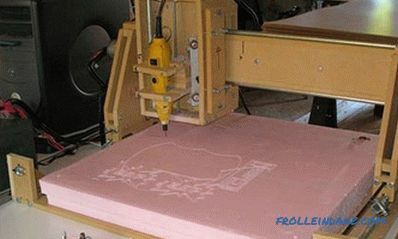 The basis of the material is made - roofing paperboard. 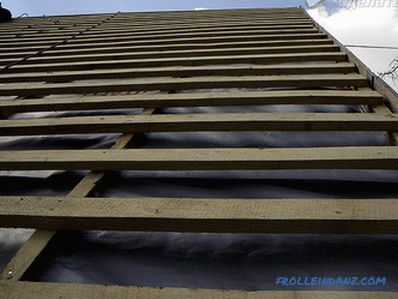 Impregnation of roofing paper with bitumen. 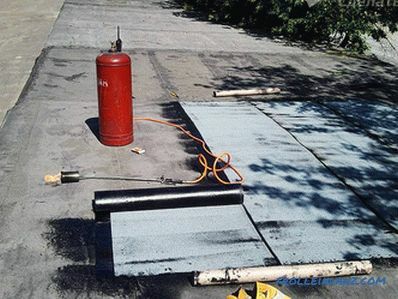 Application of refractory bitumen on the top layer of roofing material. Roofing material is made with different density of the base, as a result of which there is a need for its marking. It all depends on the scope. There is ruberoid RPP 300, RKK 350 and RKK 400. Ruberoid RKK 350 is made on a cardboard basis, having a density of 350 g / m 2 . It is applicable for the finishing coating of the roofing pie. It has a protective layer of coarse-talc-magnesite. To perform the flooring of the lower and middle layers of the roofing pie, it is better to use roofing material having a fine-grained bedding. Its marking is M. It is better to make the outer layer of ruberoid with coarse / scaly powder labeled K and P, respectively. RKK 400 is a dense roofing felt, possessing the increased resistance to weather conditions. For the manufacture of the roofing material of this brand is used an additional protective layer of asbestos. This improves the waterproof properties of roofing material. The base of the roof must be dry and level, without large pits and bumps. Also, it should not be resin. Only after that it can be applied mastic. In the past, the roof of the garage was covered with roofing paper, glued exclusively on the resin. This method is applicable in our time. 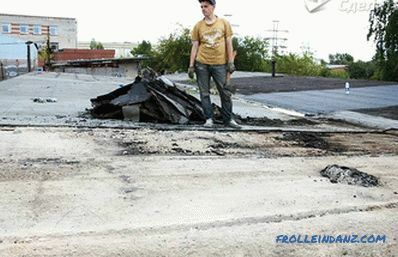 Some craftsmen only cover the roof with tar. If you decide to make the roof in this way, then you should take into account that the resin will crack with time, as a result of which the roof will leak. Resin, as a roofing material, is unsuitable for use. 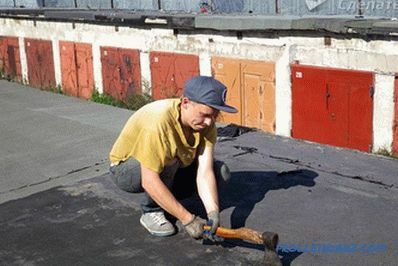 It is almost impossible to repair the defects of the resin roof. You will have to fill it with a thick layer of resin and cover with a large number of layers of roofing material. The cause of moisture accumulation on the roof can be microcracks in the resin. If you cover the coating with roofing felt, then condensate will accumulate in such cracks. The same result will be observed if a new roofing material is laid on the roof of damaged resin. If you have to rebuild the roof of a house or garage again, then the old cover should be removed. Reinforced concrete floor / screed should be the basis for a new roof. 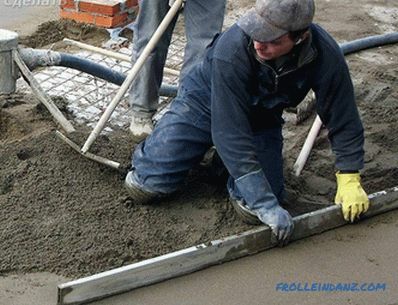 The unevenness of the reinforced concrete slab is easily eliminated by pouring the screed, which should be made with a slight slope, providing unhindered flow of water. Cement screed should be poured on the beacons, exposed on water or hydro level. Mastic should be applied to the dry tie. This is done with the help of a roller / brush. Mastic should grapple with concrete. After you can start laying the ruberoid. The drying time of the mastic can be found by reading the instructions for it. Do not cover the roof in wet, rainy weather. Although the base of the roof can be dried with a gas burner to achieve the best result, these works are carried out in the warm / dry season. The number of layers of roofing material depends on the duration of the roof operation, its slope and the quality of the material. If you plan to cover the roof with domestic roofing material, then the layers should be at least 2. If the euro roofing material can be laid in 1 layer, then its domestic equivalent should be laid in at least 2 layers. 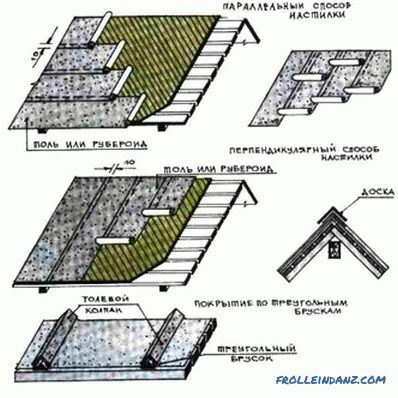 For the arrangement of the roof, which has a slope of 45º, which is designed for a short operational period, the roofing material is laid in 2 layers - prodilochny and finishing (roofing material with stone chips). 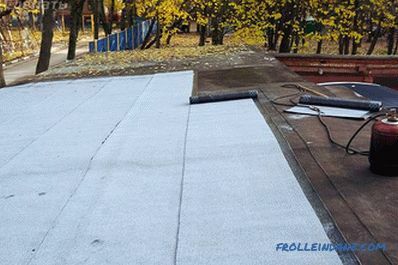 To build a more durable roof with a slope of 20-40º, 3 layers of roofing felt are laid: 2 Pro forma and 1 - finishing, hardened with stone powder. Roofs with a slope of up to 15º should be covered with roofing material in 4 layers: 3 formers and 1 final, more durable. The layers of ruberoid are stacked perpendicular to each other. If we are talking about covering a flat roof, then the minimum number of layers of roofing material is 5. Each layer needs to be glued. Layers stacked perpendicular to the previous one. 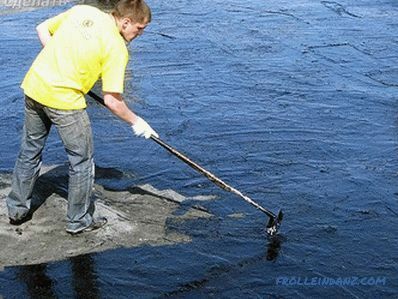 Today there is no need to melt the bitumen resin on its own, as the finished mastic from it is sold in hardware stores. 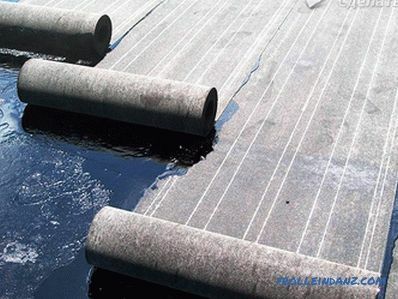 Melting of bituminous resin takes a lot of time, and besides, it can be unsafe, there is a high probability of getting burned. 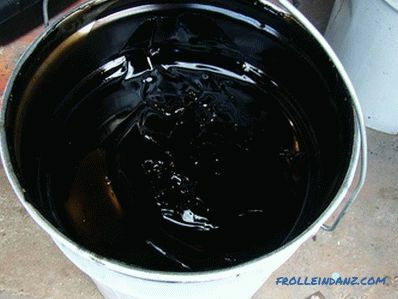 Bitumen can be diluted with gasoline. The consistency in appearance should resemble jelly. After it should be added waste engine oil, which can be purchased at the nearest service station. Such a composition does not crack and adheres well to the roofing material on the base of the roof. However, note that the mastic has a sharp smell and until it dries - it quickly ignites. It is not necessary to glue the roofing material. The only exception is its laying on a flat roof in winter. When fixing the roofing material, you can use a metal tape for clamping, in 50 cm increments. The overlap of the canvases depends on the slope of the roof; the smaller it is, the greater the overlap and vice versa (varies from 7 to 20 cm, respectively). The roofing sheet with roofing paper should be bottom-up. In this case, you need to lay sheets overlap, sizing them. In this case, water will not accumulate in the seams. Lay the sheets of roofing material across the roof slope. Do it from the eaves, bottom to top. The size of the side overlap is determined, taking into account the wind rose - 10-20 cm. So that the wind does not tear the layers. The same applies to the laying of roofing material from the gable. 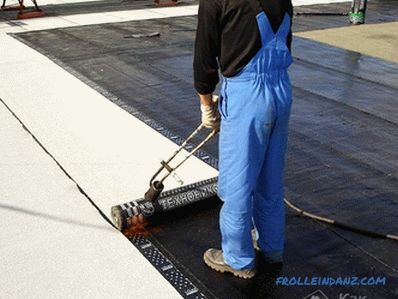 On the prepared substrate with bitumen, the first layer of roofing material overlaps — 15–20 cm. This is done parallel to the edge of the roof. The ends should be wrapped under the edge of the roof and secured with lath and slate nails at intervals of 50 cm. Then coat the layer with mastic and stack the next one with an overlap through the ridge. The edges should also be wrapped. 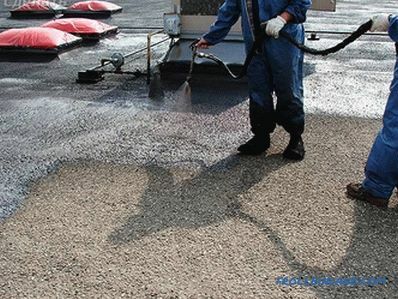 Reapply the bitumen mastic and lay the finishing layer of roofing material. Layers lay at 1/3 or 1/2 sheet offset. 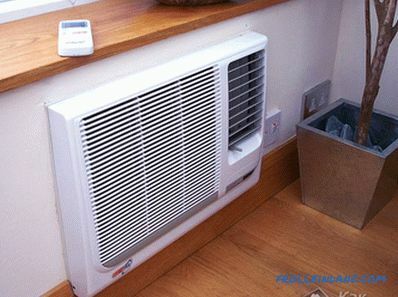 This is necessary so that the seams of the upper layer are not located flush with the lower one. To do this, cut the first cloth of ruberoid in half or fold it over a side, and the next ones will move as a result. To lay the roofing felt on the gable roof you will need a long staircase. This is necessary in order to nail the crate on the highest part of the roof. To roll out the roll in this case, you need to work harder. 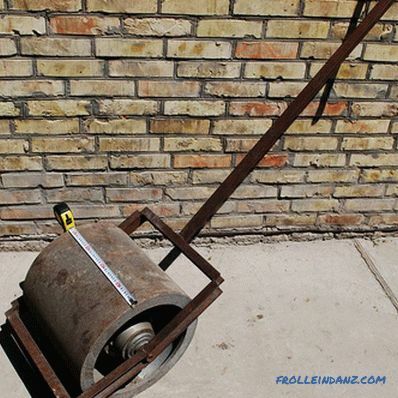 You need to hang the roofing material on a hook / pipe that will look like a spool of thread. The hook must be hooked to the crate so that you can move it crate along the board, gradually rolling the hanging roll. The last sheet is attached from the outside, because it needs to be thrown over the ridge. The next layer is laid with a throw over the ridge, across the slope. In this case, you need a ladder. 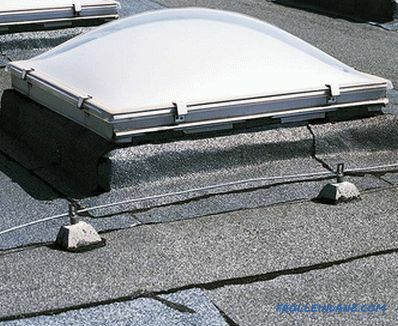 Ridge elements are not used for pitched roofs covered with roofing felt. There is a film on the roofing material, which is deposited on the roof from the side intended for heating. It becomes white when heated, and then burns. When surfacing roofing material on the roof, be extremely careful. It is impossible to overheat the material, because it quickly melts. 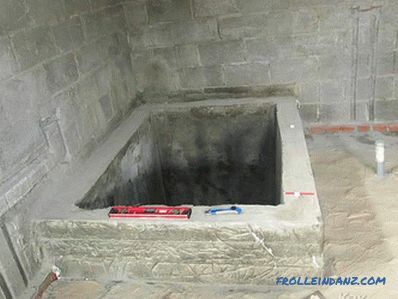 The base of the roof for surfacing is prepared in the same way that was described in the article earlier. Attach the roll, so that while rolling it in the process of sticking, walk along it. 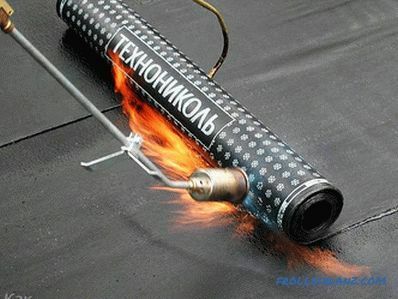 Using a hand torch, gradually warm up the roll and the mastic for 20-30 cm. After rolling the heated sheet onto a half roll, glue it and stamp it with your feet (for best results, use a heavy roller for this purpose ), straightening all swellings and folds. Then you can warm up the next section of the roll. So, gradually you will be able to roll the entire roll. When it is glued, a layer of roofing material must be rolled.Thus, you will have a more reliable connection. Apply the following sheet with an overlap of 5 cm. This can be done only after the previous roll has cooled down. As a rule, such works are done independently. Construction services companies do not undertake such minor works. But, if you want to hire workers, then you have to pay for their work. How much is roofing felt on the roof? 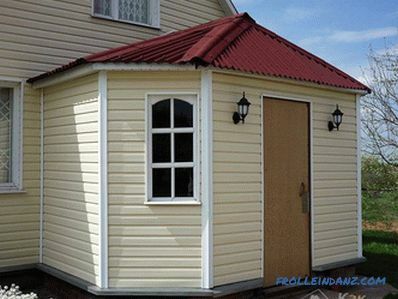 The approximate price per square meter is 90-150 rubles. Such works are usually taken to perform shabashniki. So, roofing with roofing felt can be done both independently and by inviting workers. What to do in your case is up to you. If you still have questions on the topic or you want to share personal experience, write comments to the article. A specialist working on the site will answer your questions, and your personal experience may be useful to our readers.